People spend hours on Pinterest because it is highly addictive. If you want to get more followers then you should spend more time on your own pins instead of going through other people’s pins. If you are new to Pinterest then it is important to have enough boards that are filled with pins. However, moderation is key. If you are pinning more than three pins within a minute then you are overdoing it, which can annoy your audience and they may end up Unfollowing you. One way to fix this problem is to make a secret board and to add pins to it before you publish it. This way you will have enough pins on your board and you won’t bother your followers with several pins every few minutes. A Bio is one of the most important components of any blog or social media website. People learn more about you when they read your bio. A good bio makes it possible for people to learn who you are and is mostly the reason why a lot of people click the follow button. Your bio should list things like your introduction, accomplishments, an area of expertise and a hobby. Remember, people like similarity, so if they think that there is something similar between them and you then they are more likely to follow you. You can also inspire credibility and express expertise in a field through you bio. Make sure that you include your blog’s link in your bio and then verify it with Pinterest to get a backlink to the blog. The verification gives you a checkmark which gives the impression that you are important and will earn you more followers. Pinterest is all about quality and quantity. A user is more likely to go through a board that has 100 pins instead of 10. The more pins you have, the more time a user will spend on your board. These individuals will repin your pins and give you a lot of exposure. Pinterest is loved by people because of the variety it has to offer. By pinning about a variety of topics you can reach out to a number of people and get more followers. Which Mistake Are You Making? If you are new to Pinterest then it might be possible that you are making one of these mistakes. 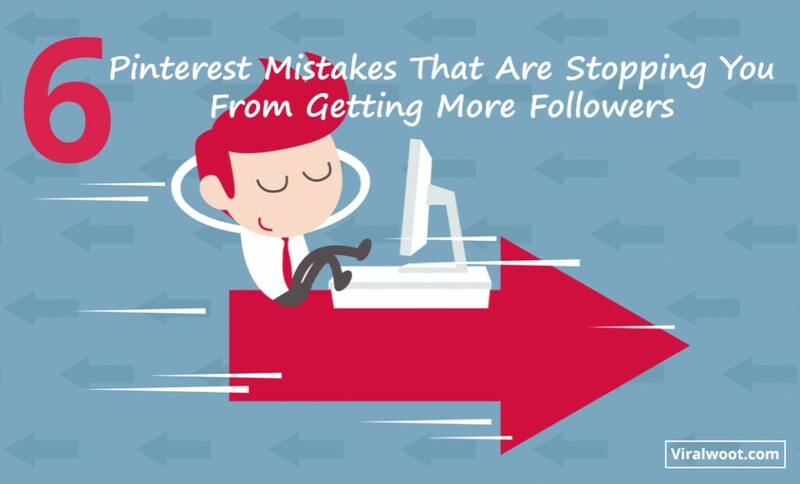 In order to get more followers you need to understand your boards and follow these tips. If you are looking for a good tool then consider ViralWoot. It offers you an amazing pin scheduler tool that will guide you about how to get more followers on Pinterest in a short amount of time & generate quality content on your Pinterest boards regularly. Opt for a free trial today, and get Pinterest famous!